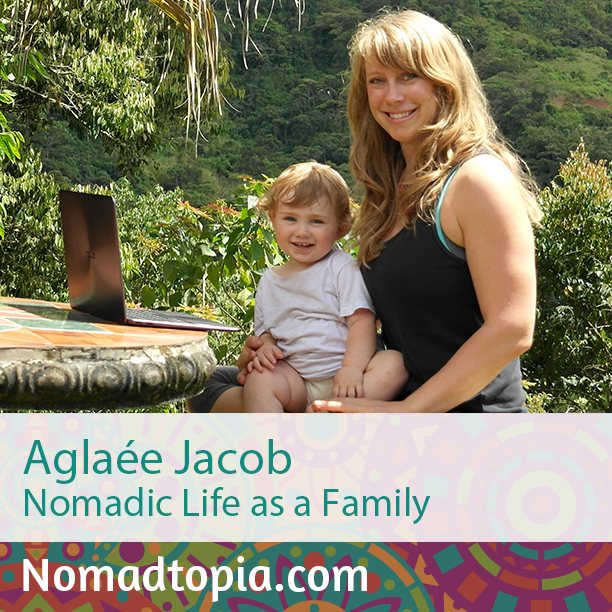 Aglaée and her husband have been digital nomads on and off since 2010, both before and after their son was born. She is also a registered dietitian whose work has been greatly influenced by her travels. In 2015 her family spent time in rural Québec and Costa Rica, with more adventures planned for the coming year. There have been so many of course, but when we arrived to our house in Costa Rica (after many misadventures including arriving very late at night with a motion-sick husband and a tired toddler, a key that wasn’t left where it should have been, no hotel in the town where we were and sleeping on the couch of a local family as our only option), we were just so thankful for finally making it. This house is located in the Central Valley and has a breathtaking view of the mountains and the cloud forest. We could even see the Pacific Ocean in the distance. We were just standing there, the three of us, trying to take it all in, grateful for being together, for being safe and healthy, and for the freedom we created for ourselves. The biggest positive surprise is that it is possible to live this lifestyle even with a toddler, although it definitely requires more planning. The worst surprise was that the quality of the food in Costa Rica was NOT what I expected. Costa Rica is one of the countries using the most pesticides and chemicals (some of them banned in North America) per acre to grow their foods and 90% of the little bit of organic food produced in the country is actually exported… I strongly believe in eating organic as much as possible and finding organic food is unfortunately not easy nor cheap in Costa Rica.